For a long time I have witnessed some inconsistencies with Blenders Glossy shader, namely its roughness value. 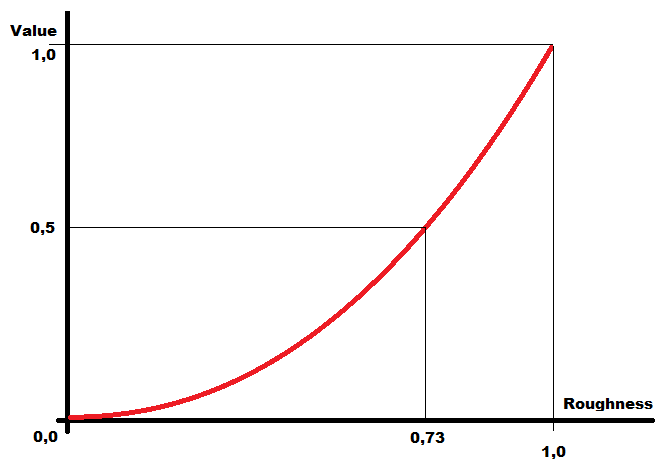 It always seemed weird to me, that there is such a high increase in roughness from value 0.0 to 0.1, as is seen here. This is also how images are gamma corrected to be displayed on monitors. This read is very helpful to understand what is going on and why: http://filmicgames.com/archives/299 . So, one would think, that Blender wants to have a linear range of grey values to determine the roughness, but it actually wants values, when corrected according to the above curve will result in a linear Value-Roughness correlation. So what can we do to get a more intuitive control over the roughness value? And how can we use glossy textures resulting from a PBR workflow, e.g. from DDO (www.quixel.se)? As we can see, we get a better and linear distribution in roughness values. In Review: Blender doesn’t use linear values for its roughness setting in the glossy shader. We have to correct for that in recalculating the input values. The result is a linear distribution in roughness values.